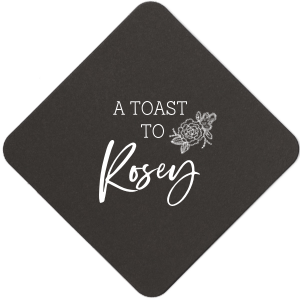 Add a layer of personalization and protect your surfaces from cup rings with For Your Party’s personalized bar/bat mitzvah square coasters! Effortlessly design your customized bar/bat mitzvah square coasters to complement your party theme with our library of design ideas and dozens of foil stamping color options. Create your personalized bar/bat mitzvah square coasters today! Personalized Bar/Bat Mitzvah Square Coasters, Custom Bar/Bat Mitzvah Square Coasters Mazel Tov! 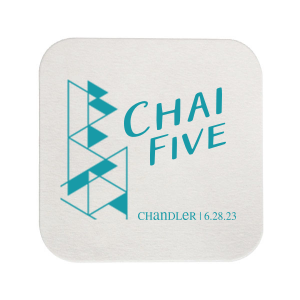 Take your hospitality up a notch with personalized bar/bat mitzvah square coasters. Celebrate this important milestone in your son or daughter’s life and at the same time protect your surfaces from cup rings with your custom designed bar/bat mitzvah square coasters. Creating the perfect personalized bar/bat mitzvah square coaster to match your party theme and colors is easy with our over 150 fonts, over 700 graphics, and dozens of foil stamping colors to choose from. 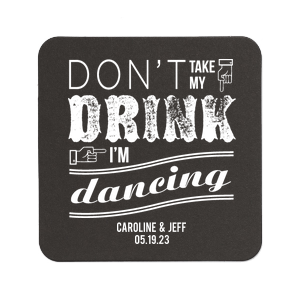 Your signature cocktails for the parents will look great atop your custom designed bar/bat mitzvah square coasters, and you won't have to constantly watch where the kids are putting their cups if you have plenty of coasters available. 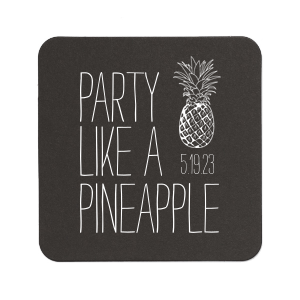 Create your customized bar/bat mitzvah square coasters today.